One of the most iconic jodis of the 90’s, Sanjay Dutt and Madhuri Dixit, are back on screen after more than 20 years. The memorable pair have been a part of hit films like Khatron ke Khiladi, Saajan, Khalnayak and are now set to appear together with their evergreen on-screen chemistry in Abhishek Verman’s upcoming film Kalank. The film also stars Alia Bhatt, Varun Dhawan, Aditya Roy Kapur and Sonakshi Sinha opposite each other, but fans are eager to see Madhuri and Sanjay set the screen on fire. Madhuri Dixit is an ethereal vision in the teaser as Bahaar Begum and Sanjay Dutt floors with his rugged handsome looks as Balraj Chaudhry. Although both the actors’ characters seem distant from each other in the teaser, the audience is showing immense amount of love since the release of Kalank’s first look. 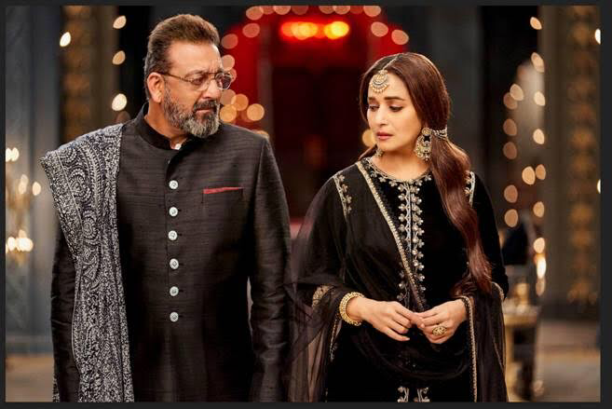 During the teaser launch of Kalank Madhuri Dixit praised Sanjay Dutt saying: “We are working after more than 20 years. Recently, I worked with Anil after a long time. It’s always wonderful to work with actors you’ve worked with before’’.